We offer a line of Full Color, Professional Plastic Card Printers that are compatible with your desktop computer. These are the same printers utlized at your local government agencies, libraries, schools, and at your local health club! Print your own plastic cards! We now offer affordable financing for as low as $67 per month! Print full color plastic cards with near edge* print coverage straight from your personal computer. 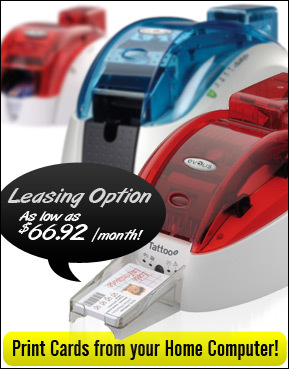 The tattoo 2 printer is the most compact plastic card printer in it's category. It squeezes into any location! The most economical way to begin printing your own plastic cards witlh the Tattoo 2 Plastic Card Printer from Plasticprinters.com! Print full color plastic cards with full coverage straight from your personal computer. Our most popular printer, the Pebble plastic card printer is an affordable solution for printing your own ID Badges, Membership or Loyalty Cards, Library Cards, and More. Prints up to 150 Cards / Hour Full Color, 1000 Monochrome Cards / Hour. Print 2 Sided full color plastic cards with full coverage straight from your personal computer. A step up from our Pebble Printer, the Dualys Plastic Card Printer is a dual sided thermal printer. It's dual sided capabilities offer added convenience and streamlines your workflow, increasing your workflow. The Quantum Plastic Card Printer is the ultimate in thermal plastic card printing technology. With the capacity to print 1000 plastic cards without having to load or unload your printer allows you to set it and forget it. The ultimate in increasing your capacity and workflow. The Quantum allows you the freedom to work on other things while your cards are printing with the confidence that your cards will be printed with the maximum in quality and efficiency.